A hatrick by Matej Vydra gives the Rams all thre points and secures position in the play-offs. Many had this game down as a home win before the Rams arrived at the Riverside but Vydra had different ideas and a strike on what turned out to be the unlucky 13th minute for Middlesbrough put the Rams ahead. Derby didn't have it all their own way and possesion was very much Middlesbrough's for the rest of the half, but the Rams held on to make it to the interval in front. Vydra the man of the match was involved again as a run finished with him being brought down in the penalty area. The resulting penalty was taken and scored by Vydra himself. Ayala who had brought Vydra down was booked, this would come back to haunt the former Rams defender later in the game. 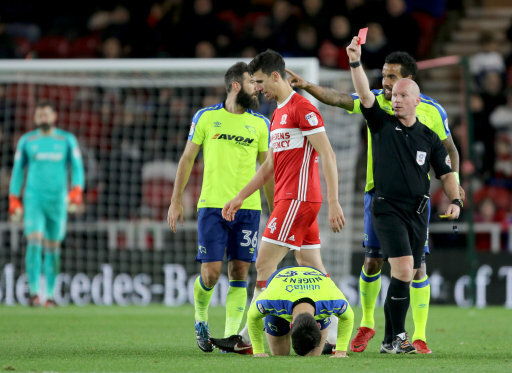 With just over an hour played Daniel Ayala fouled David Nugent and received his second yellow card and then the red. The dismissal seemed to signal the end for Boro and a few minutes later Vydra completed his hatrick after a sliced clearance by Randolf fell nicely for the striker to slot the ball into the net. Derby's prolific striker has now scored a dozen goals this season and has notched up his first ever league hatrick.